With the highly exceptional exceptions of the Rodgers and Hammerstein musicals – and the only slightly less exceptional exception of the Monkees - little attention has thus far been paid in this tale to children, or childhood. There have been many records for teenagers, more still for those who chose to progress into adulthood, and even a few aimed at those approaching second childishness, but no children’s records, as such. Many readers of a certain age may recall the era of Disneyland albums in particular, where the music formed only part of the package; there were bound books of illustrations, colourful pictures of the characters under consideration, a cheerily minimalist narrative; all designed to lead the child into Disney’s world, but with a secondary motive of leading children, whether by accident or on purpose, into the wonder of appreciating long-playing records as spectacles, events, in themselves. Certainly such things as the soundtrack album to The Jungle Book – also released in 1967 – helped steer this youthful writer towards a doubtful lifetime of considering, or at the very least fetishising, the picturesque attractions of the record. In some cases – the various Winnie the Pooh albums, for instance – there were included party games, sometimes even masks to cut out and wear. So, just as the core long-term British audience for the Monkees’ television show turned out to be children, Sgt Pepper seemed designed to attract the curious and still open-minded child before all other listeners. The original plan was for a whole grab bag of goodies to be included with each copy of the album, including cutout masks, but financial restrictions limited the Beatles to including their own pop-up characters with the record. Still, for most it was more than enough, and Sgt Pepper conveyed the instant idea of a child’s birthday party record, with lots of primary colours and famous (and not so famous) faces on the cover, a gatefold sleeve, and even, in true children’s record fashion, the full lyrics to the album so that everyone could sing along with these songs, all about different characters, just like Camberwick Green or Trumpton. Then, when or if the children eventually grew up, they would realise what the album was really about. But the latter conjecture suggests a deviousness that was certainly not the record’s aim; here, the Beatles seem to say to us, we are opening this record up to you, it is for you, the public, and meant for you, only for you. Whether young or old, square or hip, there’s something for everyone here; we intend to leave no one out. Like the work which took Pepper’s most extreme suggestions to their own ultimate extreme, Carla Bley and Paul Haines’ Escalator Over The Hill (with its “Multiple Public Members”), Pepper is a very public record, as though the Beatles were abdicating, handing their keys over to the world to lock and unlock as and how they will. Anyone, they appear to be saying, could sing or play these songs, anyone on or off the street, in the nursery or in the nursing home. Few albums in this tale insist so passionately on addressing their listeners in a markedly determined second person. Indeed the original intention behind the eighth studio Beatles album was wholly to do with childhood, specifically their own Liverpudlian ones; then “Strawberry Fields Forever” and “Penny Lane” were swiftly appropriated for an urgently-required single and they had to rethink. But much of this deceptively delicate childishness survives throughout Pepper – as does a rather unexpected core of hardness. Children here drift into hastily-drawn abstract pictures of ungraspables, or leave home, or grow old, or learn about more than one world, or in some instances learn nothing. Lucy is far more innocent a protagonist than Alice since not only does she not realise that she is a protagonist (or, more correctly, a catalyst) but also that she herself might be both Pepper’s subject and object, as only a four-year-old Julian Lennon could have imagined her. She loses herself in marmalade and tangerine but keeps the turnstile open so that she might be found. Losing themselves was certainly on the Beatles’ minds when they arrived at the Pepper concept. There is absolutely no need to underline the attendant irony of two albums by the Monkees – a manufactured band who to everyone’s surprise turned into a real group – being followed by an album wherein the Beatles pretend to be another, fictitious group. The Beatles, however, were by early 1967 somewhat fed up with having to be “The Beatles,” had stopped touring, badly needed to get off the treadmill, and McCartney came up with the Pepper idea as a means of releasing themselves from their own history, to come back as someone, or something, else, preconceptions thoroughly abandoned. To begin again, even as the planet stared hopefully at them like an outsized Labrador awaiting its dinner. And so they appeared, on the cover, primary-coloured and moustache-laden, their besuited former selves mourning their own demise as cutout idols crowded around, or at least behind, them. Then McCartney introduces “Billy Shears” – shades of that already doomed other Liverpudlian Fury? – to a shrieking 1964 reaction and the album’s first palpably whole song is given to the voice of...Ringo, as the Common Man. The party is already so well under way and its illuminations are so dazzling that the unwary listener barely notices that the record’s real purpose is already being spelled out; don’t be alone, shrugs a what-me-worry “Shears,” you’ll need some neat help to find out about yourself. What do they see when you turn out the light, and what happens if you dare to switch it on again? Still at this late stage indebted to the example set by the girl groups – check the extended calling and responding throughout the length of “Friends” – the song also subtly declares its musical allegiances to Pet Sounds with the staccato, echoed keyboard, the upwardly leaping Carol Kaye bass tropes. Ringo/Billy knows the answer already, has it all sorted; hear his good-humoured “no” or his boyish “mmmm” – this is someone who has succeeded in coming to terms in his world with the outside world, and the clear example we should all follow. So infectious is the singer’s intrinsically good nature we hardly pause to wonder what happened to the audience at song’s end. We then drift into the primary school pictures of “Lucy”; inspired specifically by the “Wood and Water” chapter of Through The Looking Glass (as well as by his son’s painting), the dissolving traceries of treated guitar and echoed/doubled-up basses are balanced out by a surprising return to Hendrix stomp in the chorus, even if McCartney’s deadpan organ suggests a hidden close kinship with the Monkees. Lucy is being followed, and it becomes clear that this is merely the latest of Lennon’s attempts, following “Girl,” to find his ideal Other. And, unlike the subject (or object?) of “Girl,” Lucy is there, smiling and waiting for him, when he manages to catch up with her. “Lucy”’s delicacy is one of Pepper’s more obvious nods to the congruent influence of Syd Barrett, then ensconced in Studio 1 at Abbey Road with the rest of Pink Floyd recording The Piper At The Gates Of Dawn – another work based on a children’s book, even if it’s one of the chapters that children wait awhile before reading – as the Beatles were busy in Studio 2; each group intermittently paid the other a visit to see what they were up to but the real bond between the two didn’t start until Lennon and McCartney saw them onstage at the Alexandra Palace Technicolor Dream towards the end of April. Barrett’s portraits were always slightly harder edged and cheekier than those of the Beatles’ – his “Emily” is a rather more purposeful and assured Lucy, and “Arnold Layne” would not even have occurred to the Beatles at that time (though it would, in markedly different form, occur to Scott Walker a year or so later). The Beatles had their own “Interstellar Overdrive” too, in the still-awaiting-legitimate-release “Carnival Of Light,” but the eyes-of-a-child approach was something that bound Lennon and Barrett very tightly together as songwriters. But the eyes of a child cannot avoid reality, and the idealistic fantasia of “Lucy” gives way to a domestic trilogy of songs as hard-hitting as anything emerging from the kitchen of dramatic sinks at the time. While promising escape, Pepper is loath to let us forget exactly what we – and they – are escaping from; a June 1967 which, among other far from flowery things, saw sundry Stones-related drug busts, the definitive legal moves towards the suppression of pirate radio, race riots in Detroit and Boston and the death of John Coltrane. In British terms you could visit or live in most places outside London, and quite a few places within London, and wonder whether it was really still 1937; the old order was firmly in place, and McCartney’s yell of “It was twenty years ago today” reminds us that it was just over twenty years since the end of the war, that cross which most British people still appeared willing to bear in 1967 – a generation behind the times. “Getting Better” addresses the hidden quandary – the incipient fear – of the new generation ending up exactly like the old. Another bright staccato McCartney melodic and rhythmic construct in the line of “Penny Lane,” its sunny surface belies the underlying rage, and it is disturbing enough to hear McCartney singing lyrics which pointedly allude to (and were largely written by) Lennon. If “Penny Lane” derived its rhythmic impetus from “Got To Get You Into My Life” and transposed it onto an entirely new planet (though eerily resembling the old one), Harrison’s hard guitar staccatos on “Getting Better” take the original Supremes model into more disquieting territory (specifically the Morse code guitar of “You Keep Me Hangin’ On” is brought irresistibly to mind). The song’s first verse, outlining a now-regretted feral youth, suggests a reluctant, eventual acceptance of the singer’s reborn self – he’s a believer, as it would be, despite Lennon’s background murmurs of “It can’t get no worse” and McCartney’s careful delineation of “a little better” in the first chorus. In its climactic third verse, however, hallucinatory swarms of sitar swim into echoing sight as McCartney, with equal cheer, speaks of beating his woman and keeping her apart from the things that she loves, thereby going far further than even “Run For Your Life” had dared. If it’s all getting better, however, then to whom – or, more pointedly, what - is he singing “since you’ve been mine” when he has just been singing about “my woman”? LSD? The disorientating sonic picture soundtracking “Getting Better”’s third verse is, as with so much else on and in Pepper, apparently the most accurate description of the minute-verging-on-gigantic perceptual distortions brought on by acid; the woozy haze, the blurred semi-reality – and I am not overlooking the unexpected return of a Hendrix-esque determination in the song’s overlapping rhythms, nor the subtly reproachful tabla working underneath. “Fixing A Hole” is, in contrast, somewhat self-reproachful; wholly McCartney’s song, its homely harpsichord and rueful foursquare march the closest Pepper gets to emulating the Pet Sounds sound with the heartbreaking “God Only Knows” falsetto rising above the downwardly-arching bass in the bridges; yet the twin lead guitars of Harrison and McCartney either comment sardonically on the singer’s domestic woe, or hang off the song’s scaffolding like a condemned man (the sinister “and it fills up” flowing through the wall’s purple veins). The jerkily violent Stratocaster guitar solo – played by McCartney (thanks to Tony Hazzard for clearing that up, and also for reminding me that this song wasn't actually recorded at Abbey Road) – is musically as angry as the album gets. Finally, the new generation has had enough; the waltzing harp which introduces “She’s Leaving Home” – motif-wise, a replica of “Lucy” after its dreamer has awakened – gives way to the third in McCartney’s stringed soliloquies, except he is not quite alone here; his matter-of-fact description of the girl’s quiet but not ashamed departure, the mother’s reaction (significantly we never get to find out how the father feels about this, except that he “snores”; the mother is quick to apportion credit for emotional blackmail with her “How could she do this to me?”), the girl’s new life is echoed by Mike Leander’s very literal orchestration – the subtle, Psycho-resembling quick strokes responding to the mother finding the letter (and “standing alone”), the bowed heads of ‘celli offering the handkerchief to “She breaks down and cries” as the words leap across the scansion border checkpoint, the stately Genevieve figures which accompany the “man from the motor trade” – but Lennon breaks the heart with his ghostly elegy of premature mourning, all of it concerned with the parents, and the girl scarcely an afterthought. His closing “Bye, bye” is not free of menace, or partially hidden feelings of triumph. But no 1967 song so clearly underlines what was wrong (“We didn’t know it was wrong”) with those who chose to drown in the vodka-and-Valium tears of easy, Brylcreemed balladry – the Vikki Carr who sobs her way through “It Must Be Him,” a #2 hit single that year, could be the missing link between the mother of “She’s Leaving Home” and Eleanor Rigby. Originally it was felt that “She’s Leaving Home” would be the ideal closer to side one of Pepper, but Lennon cannily bookmarked the triptych of homebound frustration (Wesker’s trilogy of betrayed socialism plays of the late fifties/early sixties comes to mind more readily than Osborne or Delaney) with another escape into fantasy, except that Mr Kite is far less fulsome or welcoming than Lucy; aware that some of the music with which this tale has thus far concerned itself, most notably 101 Strings and the George Mitchell Minstrels, with music and idioms consciously stretching back to the middle of the nineteenth century, Lennon inverts the crap boasts of the 1843 Rochdale poster – but how colourful it looks, or is made to sound! – to furnish something approximating a nightmare, the other side of the “Yellow Submarine” coin and the logical conclusion of the Germanic march tendency in Lennon’s composing which (also) began with “Girl.” He transfers the Rochdale spectacular to (an offhand-sounding) Bishopsgate but concentrates on disorientating our understanding of the carny, or its underbelly; Mr K challenges the WORLD but is the WORLD listening? There is no precedent – with the structural exception of “Tomorrow Never Knows” – for “Kite”’s hurdy gurdy mutation into clashing lights and sounds; the strongman will “perform his tricks without a sound,” but just as “Lucy” owes more to the incipient awe of childhood than any drug input, Henry the Horse dancing the Waltz does not suggest heroin any more than the holes of “Fixing A Hole” or “A Day In The Life,” yet its impact remains shocking. This sounds like an escape to nowhere, with the bizarre blasts of barrelhouse piano, the backwards one-man-band of Ringo’s percussion, and finally the cauldron of cut-up tapes and samples, as though ripping the Victorian ethic to pieces, with its doomed-sounding organ anticipating the Jerry Dammers of “Ghost Town,” the emptied/refilling London of Modern Life Is Rubbish. A final clash of murmuring, conflicting tonalities, and then abrupt cutoff (see “The Eternal” by Joy Division and ultimately “Unfinished Sympathy” by Massive Attack, or maybe simply see “Bike” by Pink Floyd) – and this is still supposed to be a jolly, Aquarian age-anticipating record? In fact, beneath its sheen it has proved, so far, one of the darkest records of its age, up (or down) there (or here) with The Velvet Underground And Nico. But where the Velvets had Nico (and Warhol), the Beatles had George Harrison to put it all together. Readers may recall that Harrison had to be talked very hard out of quitting the group in the autumn of 1966, and his relatively low-key contributions to Pepper – his total contribution to “A Day In The Life,” for instance, consists of playing some bongos - reflect his continuing doubts about their viability, as well as the growing “space between us” which he felt existed. On “Within You Without You” he stares the ambivalence of Pepper in the face and patiently furnishes the glue which holds the entire record together; everything on side one has led to this warning masquerading as a meditation, everything else on side two will lead out of its implications. Involving no other Beatles at all, and an unconvinced George Martin in the production booth, Harrison speaks, fairly bluntly, about why rebirth is needed and why it has to start with oneself (or one’s self – see also, and eventually, “Man In The Mirror”). This was the moment which convinced a listening Carla Bley to contact her friend Paul Haines, then resident as a teacher in India, with the proposal for Escalator; and, just as after four sides of the most askew, dreamy and nightmarish takes on popular music conceivable, Don Cherry’s patient pocket trumpet debuts on side five to elevate the music to heights of holiness. “Within You Without You” takes Pepper to its next and most necessary dimension. Brilliantly constructed, Harrison’s sitar conversing expertly with strings and his North London Asian Music Circle fellow players, the song escalates to the height of heartbreaking as Harrison pleads “With our love we could save the world if only we KNEW” (and this is also where the young Salman Rushdie and eventually the young Hanif Kureishi come in and realise how hip it is to be them at that time). And Harrison is unavoidably singing to us: “They can’t see – are you one of them?” he intones, very quietly. He first urges us to look at ourselves, within ourselves, and then to look beyond ourselves, to understand that life will go on without any of us and that every public community worthy of being called a human society has to flow in and out of this innate, central understanding. 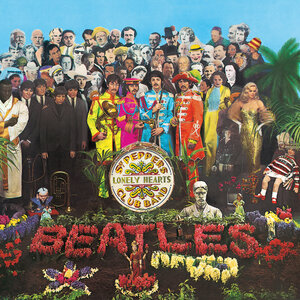 As Gandhi might have said, “Within You Without You” is not an interruption of Sgt Pepper – it is its purpose. Harrison’s mordant chuckles provide a good segue into McCartney’s “When I’m Sixty-Four.” Artfully positioned on the album so as to reassure the Beatles’ older followers that there was indeed something for everyone on the record (and that the Beatles hadn’t gone entirely bonkers, could still knock out happy, singalong standards like the old 1963 days), the song is still not as straightforward as it would seem. In fact it was a very early McCartney composition from the Cavern/Hamburg days which, as McCartney’s father was then approaching 64, its writer felt a good idea to dust down. Here, very subtly, is the other side of the “She’s Leaving Home” argument – “You’ll be older too” warns McCartney over floating, psychedelic backing vocal harmonies and Don Redman-ish crying clarinet unisons, as though the parents of the girl in “She’s Leaving Home” are advising her that she’ll end up like them. McCartney happily details all the little things which will keep us together (while the war’s going on); mending a fuse, digging up weeds, a little cottage on the Isle of Wight (“if it’s not too dear”) – it might all sound banal, he seems to be saying, but one day you’ll be grateful for it and want it. But note Lennon’s mournful “We shall scrimp and save” (and remember his “We struggled all of our lives to get by” in “She’s Leaving Home”), following which the song takes a strange turn; suddenly the happiness of old age is all to do with filling out forms, stating points of view, “yours sincerely, wasting away.” Of course, one has to view this in the context of what was originally a harmless, Temperance Seven-ish novelty period song which the group could play when their PA system broke down; but in the context of Pepper it also appears to be warning against complacency in any quarters. Grandchildren named Vera, Chuck and Dave (then again: Vera Lynn, Chuck Berry and Dave Clark)? Or perhaps simply another expression of the fear of growing old, growing into compromise, "many years from now." As if to refute all of that premature oldness, or if nothing else set it aside for now, McCartney then goes straight into “Lovely Rita,” the album’s most carnal moment, even if his passions are all kept strictly on a Carry On Orton level. Here the child finally grows up to become a man – or a manneredly mannish boy (women in uniform, and other boyish pursuits) – as the group offer a comb-and-paper horn section, George Martin provides a trapdoor pub piano solo. “Ree-TAH!” yells Paul as he settles down with her and her “sisters” and the song, bridged by McCartney’s bounding bass, moves into proto-“Magical Mystery Tour” liquidity, all echoed sighs and pants, spectral high-note piano, carburettor bass rumbles. In the Pet Sounds sense it’s like following up “Caroline No” (“She’s Leaving Home”) several tracks later with “Wouldn’t It Be Nice?” (the influence of Pet Sounds on Pepper is, as I hope I have demonstrated, largely osmotic). Paul is happy, while John is content to grumble in an explosive manner. “Good Morning, Good Morning” is the album’s most vicious track; if the comb-and-paper on “Rita” sounds like a horn section, the Sounds Incorporated horns on “Good Morning” sound like papered-over combs, violently compressed as Lennon rants and smoulders entertainingly; cereal commercials, dusty sitcoms, nothing to do but save his life (is that Lennon’s life? ), nothing to say…but it’s OK. Ringo is outstanding here, his colossal ride cymbal blows smashing into the end of every splenetic line, his extremely sardonic-verging-on-empathetic bass drum thwack in response to Lennon’s “feeling low down,” and a beat so crisp it’s worthy of sampling. The song comes very near to blowing up as in its centre a James Brown revved-up R&B interlude rudely pushes into its fibres; eventually it resembles a noisy neighbour hi-fi battle with McCartney’s deranged guitar solo adding the dash of absinthe to Lennon’s bitter cake. The song eventually vanishes into the ether as the story of evolution is told backwards in sound effects; no “Good Day Sunshine” here, and nothing much resembling cheer or the future – rather, the trumpets and hounded whoops of foxhunting, another relic from the time Pepper is secretly hoping to negate. I quoted the Tynan extract at the beginning of this piece, not merely as a sad pointer to Oh! Calcutta or as an inadequate substitute for the Times piece in which Tynan wrote the famous quote about the Decisive Moment, but in order to try to demonstrate how much Pepper is not about simply “aural and visual shocks” or up-sleeve tricks of perspective. It spread round the world but could only have originated in Britain, the buttoned-up Noel Coward land of making do and not being very good at mending. It takes a look, sometimes quizzical, more often accusatory, at where the Britain of 1967 had dragged itself, or been dragged, and offers some escape routes, even though the record makes it clear that these escape routes can only ever be mental. Like its television counterpart The Prisoner, the masks are important; they conceal truths (or possibly preserve them), are easy to hide behind when the chaos of the world proves inconvenient. And, as with Number 6 and the mask and evolution, One is finally faced, or facing, a mirror. The casually strummed guitar which leaks out of the applause like a hidden cloud of gas, the already slightly ominous piano; and all Lennon wants to do is – well, chat about the day he’s had, the 17th of January 1967, and principally what he’s read in the paper. The song as proto-blog, or extremely belated post-Walter Benjamin postscript? He looks at the paper, can’t quite grasp why other people are failing to grasp; someone he thinks he knew has been killed in a car crash, speeding through red lights at the junction of Redcliffe Gardens and Redcliffe Square, London SW10, and smashing into an oncoming truck; he can’t quite work himself up, or wake himself up, to mourn but is curious about the crowd which gathers; a crowd not really consumed by grief or sorrow – how could they if they didn’t know the victim? – but wondering where they’d seen his face before. Him off the telly. Or in Parliament. No actual concern for humanity; simply fascination in unqualified images. The cannibalistic craving for a good story. Just before the piano is about to rise up dramatically and consume his meditation in rage, he hushes it and then goes to the cinema, to see a film he’s just made, all about the war, and he gets to thinking about another, real war (but is wise enough not to spell it out to us), and wonders at the crowd – and is it the same crowd, and are you one of them? – turning away from actual blood and horror, and in any event what’s the difference; aren’t they already “existing” rather than living (see also Hendrix's "I Don't Live Today" and especially "Third Stone From The Sun" in which latter he frees himself from the earth altogether). They yell, shockingly, in a looped final groove, not ridiculing you, but encouraging your progress, your advancement, within you but hopefully not (in the literal sense) without you. It is the greatest story to be told within this tale, even though, as with cover star TE Lawrence venturing into Arabia, their mission is, despite their never bettered intentions, likely to result in a more divided world than ever. Pepper was a challenge to the world; the rest of this tale is principally concerned about how the world chose to respond, or otherwise. As though we were all still its children. An awesome commentary on the album - I had thought nothing more of interest could be said about it until this. Given it's due to be released in a restored form sometime soon I'd love to see this published in the music press. My parents bought this when it came out - along with what seemed like half the Western World - to accompany the 'She loves you' single - probably the only Pop music they owned on record. You're absolutely right about the appeal to kids - my sister and I loved it. I don't recall any Beatles masks - although there were a cut out Pepper moustache and medals by Peter Blake. For a long time I have resisted listening to the record - convinced by popular wisdom that Revolver was the superior album and also preferring that and the White Album because I had 'discovered' them as myself rather than via my parents. Having read your commentary I intend to reacquaint myself with the music again. "Nothing on Pepper has prepared us for this, especially our own expectations"
This got me wondering, how did people react to A Day In The Life on first listen? I don't mean those who have since heard it for the first time, and I don't mean someone like myself, who as a small child at the time would have heard it as a background noise (whilst doing more 'interesting things'). I mean a genuine 1967 day-oner.